Be careful who you let stand beside you. Incompetence is contagious. The prosecutors of Chief Justice Corona have no evidence and no witnesses. Even a two year old can therefore conclude that they have no case. After making themselves permanent fixtures in humor blogs nationwide they might have belatedly realized this and have now dropped five of the eight articles of impeachment. Nonetheless, they continue to harbor the delusion that they performed spectacularly. Either they are afflicted with a pathological condition that prevents them from admitting their incompetence or they are trying to save face. After having been called “an insult to the intelligence of Filipinos” by the Lady Senator from Mt. Doom, the desire to preserve whatever shred of dignity they have left seems understandable. 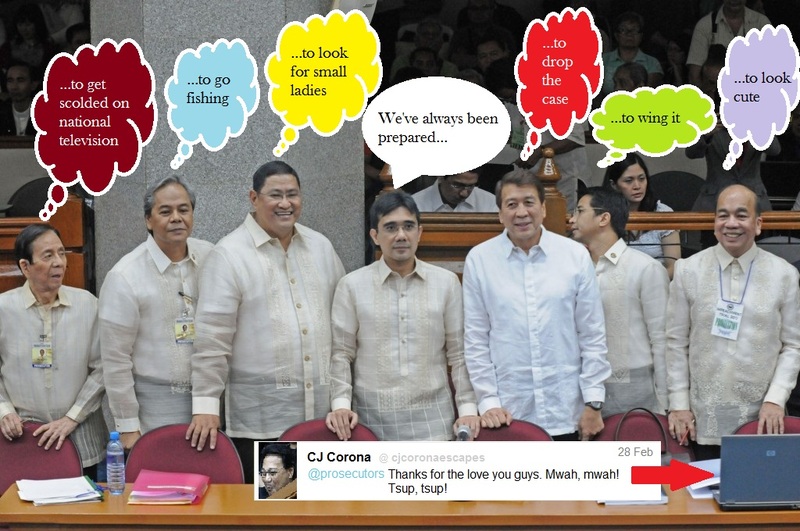 The prosecutors and their congressmen supporters however, possessed by the spirit of justice (Or is it vengeance? Johnny Blaze is that you? ), remain unfazed and are determined to cause continued shame to their kith and kin ten times removed and to everyone else named Tupas, Barzaga, Umali, Farinas et.al. They’ve been lectured by the senator-judges so frequently that they’re sure they now have equivalents of PhD degrees in impeachment proceedings. They also have the support of an anonymous backer in a yellow Porsche who supplies them with enough hallucinogens to help them imagine the evidence and disregard the law better. They’re confident they can do better next year. Gasp! There’ll be more “most embarrassing moments” next year? I hope they realize that by that time, Corona will have been able to cover his tracks so that any remaining shard of evidence will have shrunk to plankton. In a seemingly unrelated event, people dressed in yellow flocked to the streets over the weekend to commemorate the 26th anniversary of the EDSA People Power Revolution. While they prayed, sang and cheered, bystanders wondered what all the fuss was about. I have it in good authority that when members of the media asked a handful of these bystanders what EDSA meant to them, some replied that it was synonymous to heavy traffic. Others who were obviously more engrossed over Pinoy Henyo (name the word on my forehead game) than the country’s history proceeded to ask leading questions in an attempt to guess the meaning of Edsa. I can’t blame Filipinos who don’t have an answer. It’s not their fault that they ran out of school days before they could get to the second half of their history books where the revolution is detailed. My advice to common folk approached by the media during commemorations of the EDSA Revolution is to run away as fast as they can. Make the mistake of staying for even a minute and they will force a stupid answer out of you that will be immortalized on TV, forever making you the laughing stock of those who know better. Hehe. Thanks for reading goulisha. It's actually quite depressing if you think about. I wish the prosecution did better.